GetResponse has been talking about their new Marketing Automation features since April. 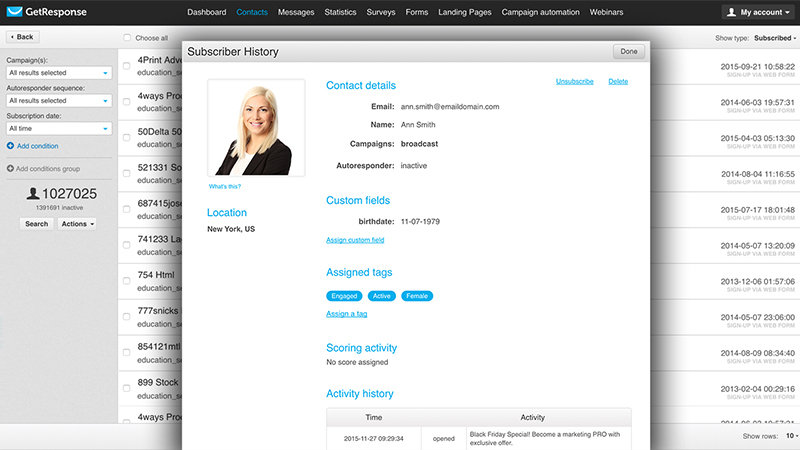 This week they officially released the beta of GetResponse Marketing Automation. The key features of GetResponse Marketing Automation are tobuild automated campaigns, tagging and scoring as well as a visual campaign builder. Before we go into the specifics, here is a video that explains the use and features for businesses and marketers that are looking for marketing automation functions to help achieve their goals. (with the obligatory banjo background music). GetResponse Marketing Automation works on simple “if… then” logic. Users can use multiple conditions, actions and filters to visually build automated campaigns. For example, if an email is not opened, then the customer is sent a reminder the next day. Although it goes further than that. Users can design workflows that automatically score and tag customers based on their reactions to offers and content. 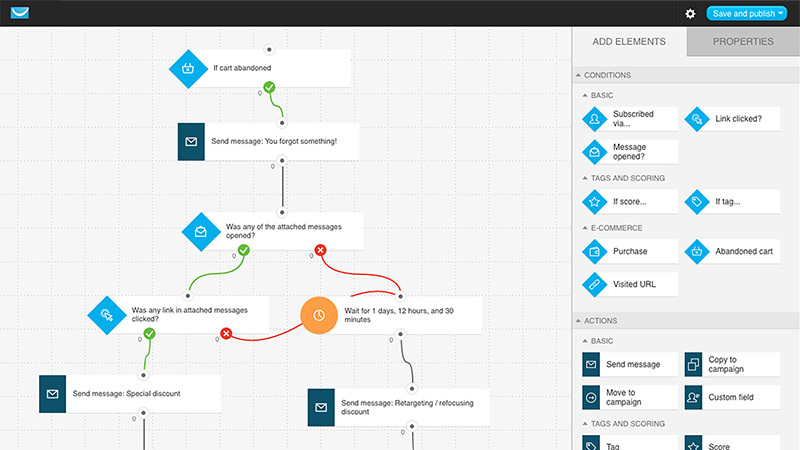 Users can setup marketing campaigns with a drag-and-drop, visual workflow automation builder. Within a workflow, conditions trigger actions. the following conditions that are available, although to keep consise some are mentioned a bit further below under “e-commerce journey”. Scoring: Use scoring to define the group of subscribers that you want to address by their score value. Subscribe: You can narrow your search to those who subscribed to a certain campaign or used a certain sign-up method. Message Open: Set this condition to find those who opened an email — one specific message or any message. Message link clicked: Use this condition to find those who clicked a specific link. Optionally, set a time limit on when they clicked the link. Tag value: Set this condition to find subscribers you’ve (automatically or manually) tagged in the past. (more about this later. The counterparts, like failure to open an email, click a link, or buy within a specified period can also be used as conditions. Marketers can use these triggered actions for example to Send an offer for a cross-sell product, Add subscriber to an autoresponder campaign or Resend messages. Range: Use this filter to limit the segment to a specified range. For example first ten subscribers who open an email, click a link, or purchase a specified offer. Amount: Set this filter to define the number of subscribers who receive the action. Example: send a gift certificate to 10 subscribers only. Delay: Use this filter to define time to wait before taking the action. Example: Wait three days and after non-click, send the next email in a series. Users can track the customer journey across any desired e-commerce site, mapping activity at three potential points of engagement. Here is an example video of GetResponse Marketing Automation for ecommerce marketers that shows how to plan a “thank you for your order” post purchase flow in the visual campaign builder. Shopping cart abandonment: Track if an online cart has been abandoned and encourage a completed purchase. Visited url / page: Learn if a subscriber has visited a specific e-commerce page or URL and keep track of their interests. Purchase behavior: Learn if a subscriber has purchased product and act on it. These data points can be used to build the customer profile within GetResponse and trigger new campaigns. GetResponse has a monthly pricing based on the number of subscribers, packaged with some additional features. 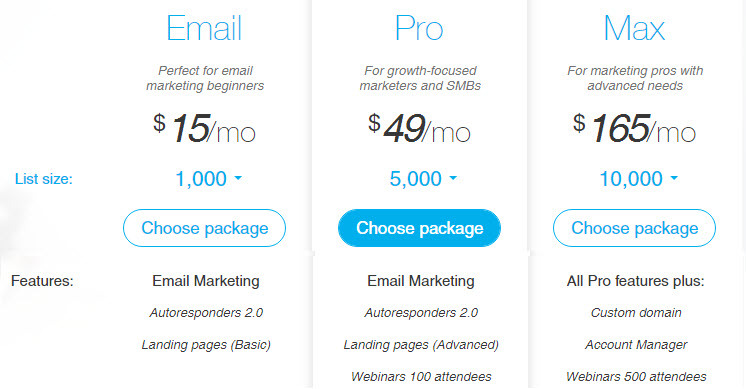 The GetResponse marketing automation pricing is included in their main product, so it is not an “extra”. The only exception is for the “email” package that has limited marketing automation features. Which makes a lot of sense, but you don’t want that one anyway because it lacks email split testing. So it basically starts with the Pro package and 5.000 subscribers for $49 per month. You can see the pricing overview here. Below is the price for 25.000 subscribers. According to the press release and video, GetResponse is changing the adoption of Marketing Automation, which historically found too complicated and expensive for smaller organizations. “Despite its benefits, many marketers fear marketing automation, believing they have to change their business to fit the platform they adopt. “This isn’t an unwarranted fear, however, as most automation services are clunky, cumbersome and take months to integrate into a business. Alongside the launch of GetResponse Marketing Automation (the software), GetResponse has also built a new part of their site with blogs, webinars, and ebooks on digital marketing (automation) strategy. Called the marketing Automation hub. You can visit the Marketing Automation hub here. Our note on the name: The knowledge resource is promoted as the Marketing Automation Hub, which is a pretty brilliant move on their part to outclass mainly Hubspot, and in a lesser degree research firms Gleanster, Forrester, and G2crowd. A Marketing Automation Hub is what is normally classified as a type of Marketing Automation software, a software category. And in that move might be a glimpse of where the vendor is headed with their strategy.